I don’t know about you but around the third daily time I get an email about hand soap, I’ve lost it. However, heaven forbid I unsubscribe lest I miss out on a sale I actually want to participate in. Either way, most of the time those emails are deleted. Emails I get with funny dog videos though permanently remain in my inbox. These are difficult times for those in the marketing, or so it seems. The internet is like this alternate universe in which we use for social comfort, anger for fake news, write our freedom of speech, or even where we shop for coconut oil-based facial serums with free shipping. The internet, according to Science Daily, generated over 90% of total data in the last couple of years. Talk about going viral. Good marketers know it is not about the product, it is about the customer. Without the customer, your stellar product might as well only exist in your dreams. You need to know your audience and then the individuals in your audience. Thanks to things like Pinterest and Instagram, consumers are not only be introduced to things they want but also the lifestyle they are purposefully perceived to be associated with it. Visual media like the ones mentioned present consumers with a story of the products. This makes consumers even more so aware of what they want, how they want and where can they get it. Personalized engagement is what clients these days look for, whether products or services. That is why general email blasts are turning more customers away. In fact, an online study found that 74% of online customers get annoyed when they see ads, offers, or content on websites that doesn’t interest them. People are ready to abandon such sites completely where the content is not to their liking. Pinterest and Instagram are already subjected to their right audience because their audiences literally chose to follow them. However, you, the provider, have that same ability to know your “followers”. You have their ordering history therefore you know their needs or wants. According to Forrester, when targeted messages such as email are categorically personalized to buyers, they are 200% more likely to read it. Stop sending out generalized blind emails and start using a CRM or Customer Relationship Management software instead. CRM allows companies to automate, organize, and streamline each and every aspect of customer interaction, including sales, marketing, customer support and service. Now technically you don’t need CRM but the alternative kind of stinks. Companies without a CRM are organized chaos. Companies will try running multiple marketing campaigns at the same time to make their customers feel personally noticed. Companies will individually run concurrent campaigns with different purposes. Campaigns for attracting new clients, upselling and cross selling, cultivating prospective leads, and holding onto existing customers. And guess what? All of those campaigns run concomitantly. Obviously, managing numerous campaigns all at once without an advanced and effective tool cannot be fun. I imagine it’d be like taking your kids to Disney and they all run off in different directions (yikes). You shouldn’t have to run around for every campaign you’re running. Think of CRM as a nanny for each of your kids…or campaigns. Customer segmentation is one of the most important aspects of marketing. To not know how to divide up your customer base is to not know your customers at all. Appeal to their specific online shopping cart and we promise they’ll keep filling it up. A CRM software helps you to segment your data according to your customers purchase history, what they bought again, what they returned, their thoughts from reviews, what they like to read, and their social media inclinations. This provides marketers insight who their individual customers are. 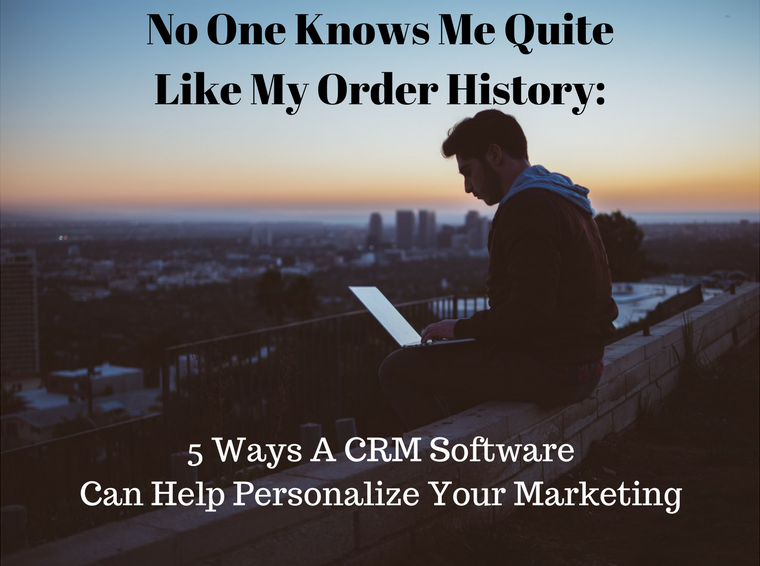 A CRM software system will sift through all the data and pick out potential customers who are more inclined to purchase your product or services. The system filters through a list of contacts and throws out customers who are potentially profitable. A CRM system streamlines each aspect of customer interaction which makes it possible for your marketing team to understand their preferences. This allows you to take appropriate action to improve their satisfaction. Once you have shortlisted the customers into different categories based from their interests, you can send personalized messages. Do not start with the usual generalized greetings of the past like ‘dear customer’ or ‘friend’ because now you know you’re talking to- age, gender, preferences, etc. In any organization, when marketing is done systematically according to a CRM plan, it becomes easier for the sales team to take over the prospects from thereon. Again, while passing on the lead, you do not just pass the name and contact info to your counterpart in sales, you give them what matters. All the conversation that your marketing team has had with the prospect and vice versa is shared with your sales team, which increases the chances of conversion. A CRM system gives your campaign the right direction and keeps it on track with the real time visibility of each program while maintaining a proper marketing execution schedule. Even if you are running multiple campaigns, a CRM software allows you to keep tab on all of them, without a chance of an error or any kind of slippages. If your organization has not as yet started using a CRM system, it is time you get eZnetCRM. eZnetCRM is easy to navigate, cost effective, and allows you to take care of your product while we take care of your customers. If that’s not enough, eZnetCRM is also capable of providing a 360-degree overview of all your marketing activity and business while managing your sales processes and customer relationship. Go ahead, be everywhere at once. eZnetCRM will help with that.